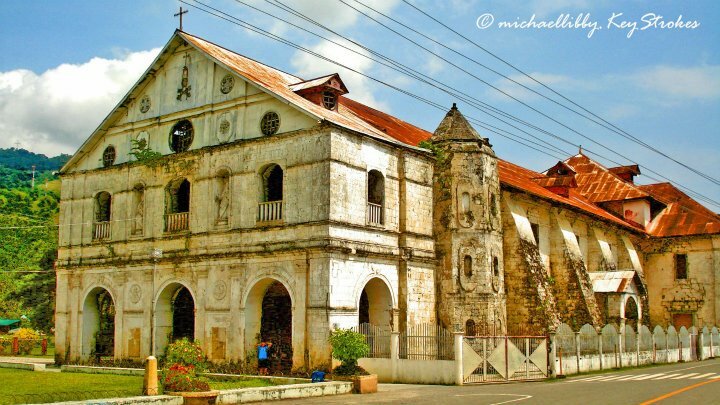 Loboc church 2 years ago before becoming an earthquake aftermath. The Belfry that stood a few meters across this view and possibly my vantage point where I took the shot also collapsed in the same event. See images and videos of the aftermath here. And call upon me in the day of trouble; I will deliver you, and you shall glorify me. Panic, regardless of extent, hit us at one time or another. The slightest scare and sheer change to plans devastate us. Unexpected events shake us -- all because we are afraid of not being able to take control of circumstances. We want to be heroes. We always want to be on top of things and the moment we start tipping the scale, we go crazy of the slightest possibility of losing our balance. And sometimes, when we have lost against surprise, we always remind ourselves to always be aware of the signs to avoid a repeat. I, too, want to perfect the stories my way at all times. And I thought I had it until the latest 7.2 magnitude earthquake happened. I was sleeping the morning the earth underneath me shook madly. The sound of the squeaking ceiling, the falling items from my desk, the shaking wall spewing sediments of concrete on the floor down to the stairs, and the noisy neighborhood sped me out of the house and into open space. Others call it “the worst alarm”. I aptly put it as “my wake-up call”. It literally shook my drowsy cells to life. I thought what I saw were harbingers of a greater catastrophe. When it ceased a few seconds after I was safe, I felt utter relief. It dawned on me the reality of how natural calamities like these leave us helpless. I mean, we can still be heroes and attempt to save lives while it happen, but even heroes die saving. The reality of death is so immense so much that it has become the priciest of prize scientist and inventors lust to cheat up to now. And all efforts by far remain futile. The least success they have, maybe, is deferring the results of ageing – but not age itself. I wandered around town hours after the quake and saw for myself how the aftershocks managed to maintain fear and anxiety in everyone. The scene was ghostly and their faces looked ghastly dull and empty. There were only a few out in the streets. Traffic was bad in some junctions but other areas appear deserted. It almost seemed like you could run will-nilly anywhere with less probability of getting bumped by a car. To fans of zombie movies, it could well be put as a “zombie land”. I journeyed the streets of Colon, downtown of Cebu. It was widely spoken that the belfry of Basilica Minore del Sto. Nino was broken. Concrete walls on some of the old buildings were either cracked or shattered. Fallen debris are conspicuous in some areas. It was not really the most horrible scene, but the damage is noticeable. What used to be the most crowded part of town seemed solitary today. A couple of strong aftershocks got me back up at my feet while eating in an old restaurant (as if really testing limits). I and another customer almost fled without paying. Everyone ran to the streets again and when it felt safe, went back in. My knees were still wobbly when I got onto a jeepney. My stop was near Cebu Doctors Hospital rumored to have had damages in one of their machine rooms. It required no digging into further details because the sights of patients under tents outside the parking area and at the roadside tell the story. Oxygen tanks and other medical equipment were set-up outside and treatment is on-going (video here). My salute goes to all the hospital doctors, nurses, staff, and crew who stayed to attend to the patients. I could only leave to my imagination the risk they have to courageously fight through when the actual 7.2 magnitude earthquake happened. It must be gruelling deciding whether to abandon ship or stay with their patients. I finally made my way home unscathed. Even if it started here today, I still feel safer coming back to a familiar place. I know I have to remain alert for the next 24 hours for similar or worse case, however, I know there is nothing I can do about the situation. The nature of the event is too large to put into my own hands or anybody else’s. My mind, in fact, is too limited to even comprehend why it happens as it is. If superheroes existed, I would have dialed to reach them. Unfortunately, they are but only ready escapes from reality. Nothing is clearer than understanding that God’s sovereignty is at work. Failure to realize that at the end of the day would certainly be an awful miss. I mourn for those whose loved ones have died in this tragedy. I pray for treatment and healing of those who are injured. I praise God for everyone else who survived. I thank God, I am alive. The scripture I wrapped around this article is the same scripture on my smart phone from the DailyBible mobile application I installed for free. Those were the words I opened onto a few minutes after the 15 to 30 seconds shaking of the ground. I suggest, if you have not yet installed a similar application, that you do now too. It can be a handy source of comfort at times when you need it most. Note: I am still experiencing dizzying aftershocks of the earthquake while writing. Be safe. God loves you. The alphabet makes words, words make songs and poems, and form opinions, opinions make conversations, conversations tell the story... ME.